The star, who slipped from the public eye for a two and half year spell, said he felt like Superman losing his powers and believed he no longer able to perform. The Let Me Entertain You singer has previously spoken of difficulties of coming to terms with a bout of stage fright, but in a new interview he says he had actually stepped out of music entirely. He tells the January edition of Q magazine: "Actually what happened was I'd retired. I didn't say anything but I'd retired. "I'd lost my confidence and I was really scared of the world and scared of my place in it and scared of the industry. You know Superman loses all his powers in Superman II? I felt as though I'd give up all my powers and I couldn't do the thing that had commanded 135,000 people at Knebworth." He said that even though he eventually recorded a follow-up 2009's Reality Killed the Video Star, he could not face up to stepping back into the limelight. 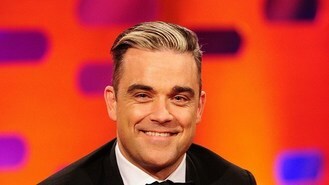 Robbie went on: "I didn't know how to do it. I'd got an album together, but I was terrified to promote it. "I'd had three years sitting on the sofa, eating doughnuts and crisps and not wanting to come back. But kind of thinking that I had to - and being scared." An appearance on The X Factor to promote the album in 2009 prompted concerns that he returned to the days when he was struggling with drug use. But he told Q, which is on sale now, that he was simply "petrified". "I honestly wasn't on anything whatsoever other than coffee," he added. As the album came out he had spoken of his reluctance to return to live performance and it was only rejoining the line-up of Take That which allowed him to get back on stage. "I needed to come back whilst being camouflaged, so Take That was the perfect vehicle to do it," he said. He has gone on to regain his nerve and tour once again, promoting last year's Take The Crown and he has lined up further shows to showcase his current release Swings Both Ways, which became the 1,000th number one in the album chart.